“Kawaguchiko” may sound unfamiliar to those who have never visited Japan before. If you are planning on seeing Mount Fuji during your trip to Japan and you have a Japan Rail Pass then you should continue reading. 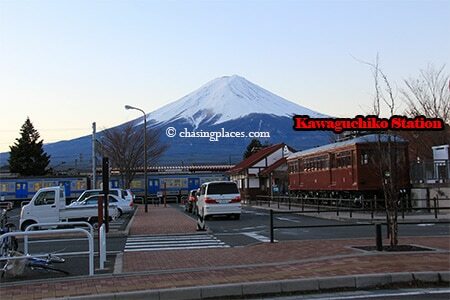 Kawaguchiko is one of the most convenient and breathtaking locations to view world famous Mount Fuji. There are many different locations to capture memorable photos of Fuji, but Kawaguchiko is one of the most accessible locations from Tokyo to capture water reflections as you take photos. Kawaguchiko is the town and it surrounds Lake Kawaguchi, which is one of the renowned Fuji Five Lakes. Typically, tourists try to head to the north shoreline of Lake Kawaguchi or book a room with a view to get the best vantage point of Mount Fuji. Since a large number of tourists who visit Japan use the Japan Rail Pass, we figured that it would be convenient for our readers to know the cheapest way to get to Kawaguchiko using the rail pass from Tokyo based on our personal experience completing this journey. Since Kawaguchiko is located within the region of the “Fuji Five Lakes” be prepared for top notch scenery. Here is a step-by-step guide on how to get from Tokyo to Kawaguchiko (Mount Fuji) by train using the Japan Rail Pass. 1. 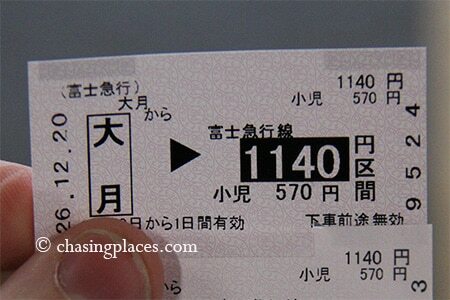 Only specific trains in Tokyo are covered by the Japan Rail Pass. The circular JR Yamanote Line and the horizontal JR Chuo Line are both covered. Flash your Japan Rail Pass and use either one of these lines to get to Shinjuku Station (this component of your trip should be free of charge for rail pass holders). Duration: Expect this to take up to a maximum of an hour if you are staying on the east side of Tokyo. 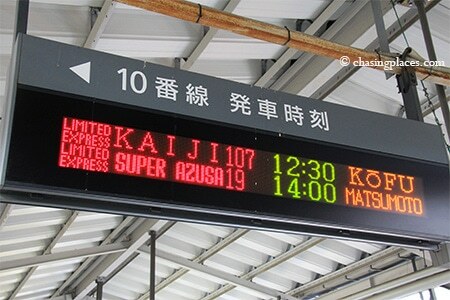 Proceed to Platform 10 for trains bound for Kofu. You will get off at Otsuki Station which is before Kofu Station. 2. The next segment of the train ride from Tokyo to Kawaguchiko consists of travelling from Shinjuku Station to Otsuki Station. This train to Otsuki Station will typically be bound for Kofu or Matsumoto via platform #10 in Shinjuku Station. 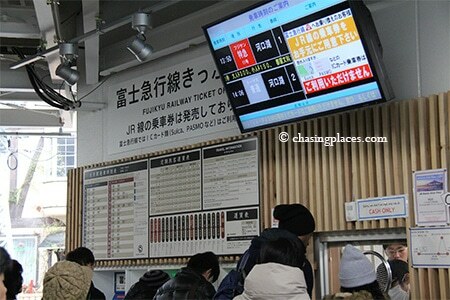 Otsuki station is just one of the stops along the way to one of these terminal destinations. Cost: Free for Japan Rail Pass holders (1320 yen if you don’t have a rail pass). The train heading towards Otsuki will only wait a minute or two, so be sure to be at your correct car number. 3. After you arrive at Otsuki Station you will have to transfer to a private train ride that is not covered by the JR Rail Pass in order to get to Kawaguchiko (for views of Mount Fuji). Therefore, make sure that you have some extra cash on hand. Purchase a ticket from the office at Otsuki Station for the Fujikyu Railway service and hop on the next departing train to Kawaguchiko. Duration: 45 – 60 minutes depending on the service available when you arrive. Cost: 1140 yen for the normal train (an additional 300 yen is charged for the faster train that takes 45 minutes (1440 yen total)). The train from Otsuki Station to Kawaguchi ko Station costs 1140 yen. If they make you pay an extra 300 yen it means that you are taking a faster train (1440 yen total one way). 4. Once you arrive at Kawaguchiko Station, Mount Fuji will be visible if it is clear outside. To get the best views you can either purchase a retro bus ticket or walk to the north shore of Lake Kawaguchi to get the best views of Mount Fuji. There are English signs throughout Kawaguchiko to assist you along the way. You can quickly determine whether Mount Fuji is visible once you arrive at Kawaguchiko Station. 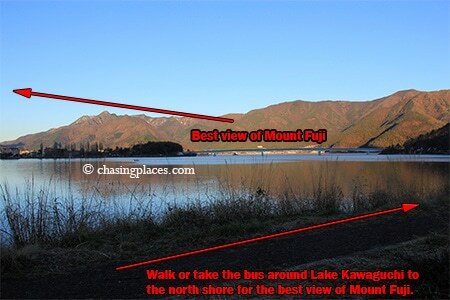 Walk to the north shore of Lake Kawaguchiko for the best view of Mount Fuji. Since Mount Fuji is often covered by clouds we recommend that you spend at least one night in the area to maximize your chances of seeing it. When we arrived the first day it was not visible due to cloud cover, but the next morning it was spectacular. To check out the hotels offering the best views of Fuji around Kawaguchi Lake click here. Use the comparison feature at the top of the page that makes it easy to see what works for your budget and preferences. Also, if you want more specific information about departure and arrival times refer to http://www.hyperdia.com/. Where did we decide to stay in Kawaguchi-ko? We had to conduct a bit of research before we determined where to stay in Kawaguchi-ko. Since we were on a strict budget we couldn’t afford some of the hotels with the nicest views from the Lake. Therefore, staying near the train station became our priority. We eventually opted to stay at the Kawaguchi-ko Station Inn. We don’t have a direct affiliation with this property, or any property in Japan. Therefore, our opinion of it is an unbiased one. It turned out to be a super nice budget choice. Very clean, quite low key with a common room in the basement. The onsen was a great treat and something that I didn’t expect at a budget place to stay. It took us about 10-15 minutes to walk to the lake from this property and only about 1 minute from the train station. At the time of writing it had an excellent score of 8.4/10 based on 503 verified customer reviews. We feel that is score is a very accurate representation of this property. If you want something a bit closer to the Lake, then please read the section below. When we visited Fuji we first checked out Tokyo, and then made our way to Kawaguchiko using our Japan Rail Passes. Most tourists that visit Fuji typically fly into Tokyo’s Haneda International Airport or Tokyo’s Narita International Airport. These airports service flights from all over the world. Therefore, when you are trying to book your flight to Japan online these two airports should be considered if you’re trying to find the cheapest flights. What is the closest airport to Mount Fuji? The closest airport to Mount Fuji is called Mt. Fuji Shizuoka Airport. Most international tourists haven’t even heard about this airport, but according to our research, if you’re flying into or out of Mt. Fuji Shizuoka Airport then there is a good chance you will get some great views of Mount Fuji. At the time of writing, domestic flights to/from Sapporo, Fukuoka, Kagoshima, and Okinawa were available at Mt. Fuji Shizuoka Airport. Some international flights also fly to/from Shizuoka Airport, but they are quite limited. At the time of writing, you could book a flight to Shizuoka from Seoul, Taipei, Shanghai, Wuhan, Ningbo, Nanjing and Hangzhou. How can you find the cheapest flights to Mount Fuji or Tokyo? Thanks for the detail step by step on how to go to Otsuki Station. I just want to ask if I don’t have JR pass, can I use Suica card instead to go from Shinjuku Station to Otsuki Station? Hi, you said “To get the best views you can either purchase a retro bus ticket or walk to the north shore of Lake Kawaguchi to get the best views of Mount Fuji.” Could you please let me know how long it takes to walk from the station to that north shore? I would appreciate if you can point it out on google map as well. From Kawaguchiko Station, the walk to the north shore of the lake takes about 25-30 minutes. It is about 3 kilometers. was really confused about how to go there from tokyo, after looking at internet for a while I found you and I felt by far is the best step by step “how to go” blog out there. Thank you! Thanks so much for the compliment. Please like us on Facebook: https://www.facebook.com/chasingplaces.net/ to check out our new articles. 1) What are the options for transport from Haneda Airport to Kawaguchiko train station? 2) Is it possible to take the Japan Rail from Haneda Airport to Kawaguchiko train station? 3) We also intend to visit the Fujiten Snow Resort. How can we know the opening schedule of the resort? We need to find out if they are open on 6 Dec 17. 4) How do we get to Sibuya Train Station from Kawaguchiko train station? For the train routes to specific places try this website:http://www.hyperdia.com/en/. It will tell you what route to take to get to and from Kawaguchiko train station. Unfortunately, online information states that Fujiten Snow Resort is open around early December, but it does not say the specific date. I think maybe they are trying to determine if the snow condition is good enough for skiing and other activities. My advice is to call the resort directly around the end of November and ask if they are open December 6. If you like our articles and appreciate our effort, please subscribe to our email list and like on Facebook. Have a great trip! 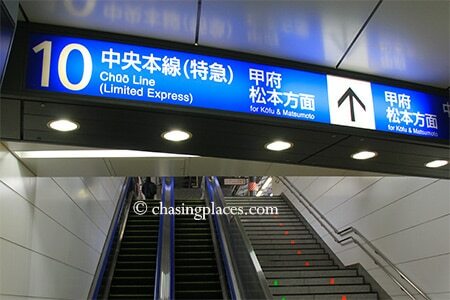 1. what train do we need to take from Shinjuku to Mt. Fuji? We want to experience shinkansen. If this is not possible, that’s okay. 2. Which is better to get Retro bus/Omnibus or the Hakone/Mt. Fuji Pass? 3. Is Kawaguchiko Hotel near the lake and Mt. Fuji? 4. Will recommend for us to stay overnight in Hakone? I would appreciate any comments/thoughts that you can share. Thank you. hi.. I am intending to visit during March this year.. Would I need to book the tickets to get to Otsuki from Shinjuku prior to my visit or will tickets be readily available or can be bought over the counter? plus if I wished to take a bus back from kawaguchiko station, what bus should I take or refer to? Thank a bunch! Depending on the railway network you will choose, you can book some train connections online. However, in our experience, there is no need to book train tickets in advance. You just need to show up maybe an hour before your intended train schedule to secure a seat, as there are plenty of seats and trains are regular ( except for really busy times in Japan, when locals tend to go back to their hometown). With regards to the bus from kawaguichiko, which place are you going to? You did not mention. The kawaguchiko station has buses going to a couple of destinations, but where you are going, you will most likely has to do more than one transfer like bus then train. I would suggest that you ask for the help of people managing your guesthouse or hotel. We found the Japanese people extremely helpful. Best of luck to you and safe travels! hi.. thanks for replying… I am intending to take a bus back from kawaguchiko to Shinjuku. Would it be necessary for us to make reservations for buses or would it be safer to just take train back? I am also afraid of the evening jam which happened when I was there last year but was departing from gotemba premium outlet. We were stuck in a traffic jam getting out from gotemba for nearly 2 hours. Your response would be great as I will be bringing my parents along this time and bringing elders may be quite difficult as they have more needs and I am currently preparing the itinerary so that things would not be hectic for them. Thanks for tips. How do I get to 5th station from kawaguchiko? Thanks. Hi! May I know if the suica pass covers the train routes? Please like our Facebook Page and join our community if we helped you in any way. This is the best direction/guide I saw on the internet for someone has never been to Japan and trying to make to Mt Fuji. Thank you so much! I am going there in July and will stay at Kawaguchiko lake. They have July 4th fireworks there, any good? Thanks for the compliment Ran. We have not experienced the Fourth of July fireworks on Kawaguchiko but the lake and the scenery is stunning so fireworks will just make it even amazing..
We are looking forward to visit in a couple of weeks. Thank you kindly for posting.